Let’s go for the next step. The application is growing, but so far the Pyroes have been sourced directly from a list of objects. A real life web application would fetch the information from the network. And that’s why we are also going to do it … virtually. AnPyLar includes an Http client which can fetch data from the network using ajax, but can also deliver data from local sources. To avoid having to set up a server with an API, we’ll start by using the local sourcing facility. The Pyroes in mock_pyroes.py are no longer Pyro instances. The structure is an iterable of dict entries. And this is so to reflect data that would flow from the network (because the translation to/from Json is straightforward) and somehow the structure of database. 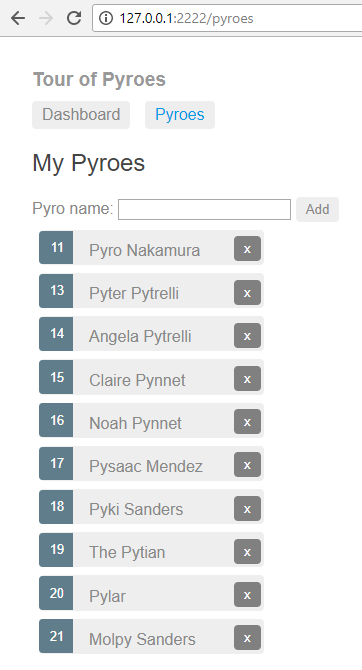 Import PyroSearchComponent. This is to make it usable in our DashboardComponent, because the pyro_search is part of no route (we could have of course imported in the package defining our DashboardComponent. Do it so if you prefer. The Http client in AnPyLar can accept an iterable of dict entries (you tell it what the key is for sorting purposes) and hijack requests that are directed to specicic routes. In our case: url='api/pyroes'. There will be a basic CRUD interface mapped to the POST / GET / PUT / DELETE http methods. With that in hand we can have a look at the changes/additions to the services. Our PyroService has grown quite a bit, but it is still generic. It uses the Http client to issue the aforementioned POST / GET / PUT / DELETE calls in order to implement the CRUD interface. 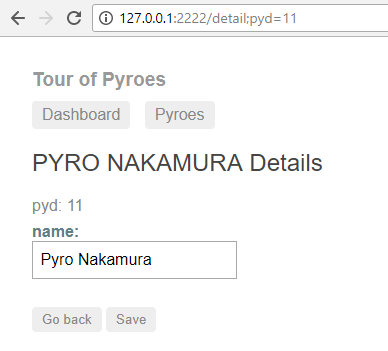 It is here that the Json stream from the network gets translated to Pyro instances. 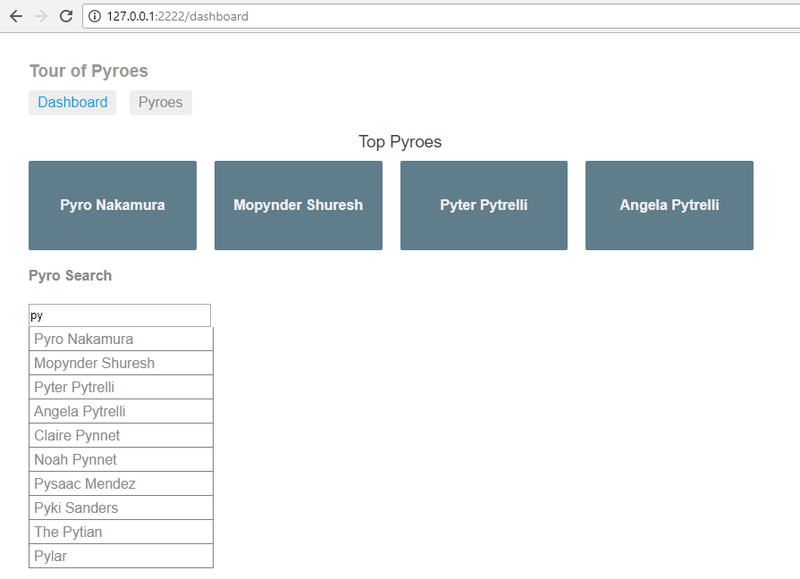 Recall that we have redefined the Pyroes in mock_pyroes.py to be an iterable of dict entries, because it simulates network information and a database structure. evt.stopPropagation()  # avoid evt clicking on "a"
The PyroesComponent has acquired in the html code (pyroes_component.html) an input field with an Add button, which will obviously serve to add new Pyro instances. Both the Add and Delete actions are served by the methods pyro_add and pyro_delete which piggyback on PyroService for the actions. Editions to the name of a Pyro have to be saved Before it was just a matter of editing and the changes were shared across components. But now, the component will be talking to the network service and updating the name remotely. This is obviously not very efficient, because the application could cache the changes internally and avoid hitting the network for everything each and every time. But this is just a sample to show how various components coordinate over the network service. 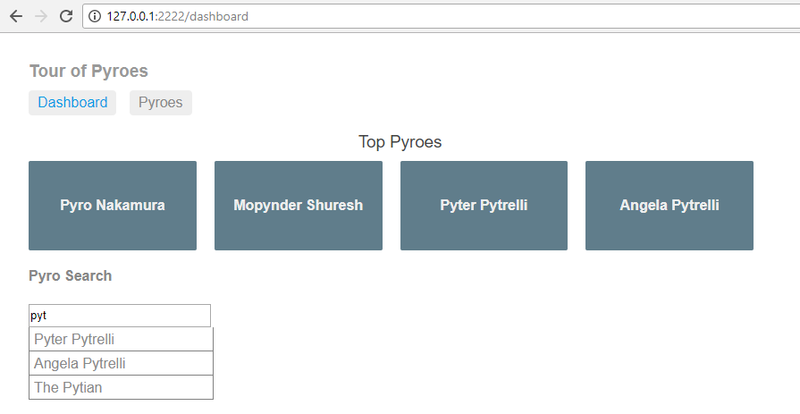 We have already seen above that the dashboard has gained a <pyro-search> tag which will be implemented by a new component. And we have already created the service PyroSearchService which will be used by it. And we add the code, html and css content. Defines an input for which we add a bidirectional binding to an observable (which will be defined in the python code) with: *_fmtvalue="searchterm_"
Define a place holder with <ul class="search-result"></ul>. It will be inside in the form of dynamically created <li> tags that the search results will be displayed. Defines bindings (Observables) for the functionality (pyroes and searchterm) which will for example be cleared during the unloading phase. This is meant to clear the list of search results and the input field for the search. Defines a dynamic rendering with ul._render(sought_pyroes, self.pyroes_) Notice that unlike in previous similar bindings, we have defined def sought_pyroes inline. Previously we used methods of the component. Just a different way of doing it. debounce(300): if the searchterm changes within 300ms, discard the previous term. This effectively buffers the sought term for a maximum of 300ms to see if there are any changes. When typing, this is quite common. And because this is inviting, let’s type something exciting like py. If you type it fast, there will be no results displayed until 300ms after you end typing it (this is a static document … difficult to show it). And let’s give our new Add and Delete functionalities a try. 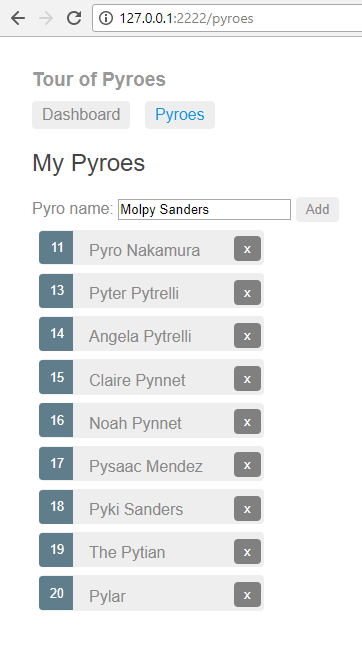 We’ll be deleting the 2nd Pyro (our friend Mopynder) to see how this is reflected in the dashboard and we’ll be adding a new super-pyro: Molpy Sanders, who can locate any other Pyro. Last but not least, let’s see how our editor looks like.